Background: Early and successful individualized management of infantile cholestasis depends on the time of diagnosis. Objective: The objective of the study is to assess the clinical value of serum total bilirubin, direct bilirubin, and alkaline phosphatase in children with cholestasis. Materials and Methods: Sixty patients with diseases and 25 healthy controls distributed into three groups – total/direct bilirubin, and alkaline phosphatase were measured for all case and control studies by enzyme-linked immunosorbent assay. 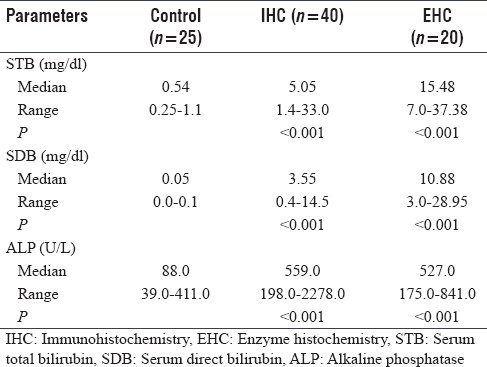 Results: The results showed serum total, direct bilirubin, and alkaline phosphatase have a highly significantly elevated in intra- and extra-hepatic cholestasis groups when compared with control (P < 0.001). There was a significantly elevated serum total and direct bilirubin when compared the extrahepatic cholestatic group with intrahepatic cholestatic group (P = 0.002 and 0.017), and there was no statistical difference between the intrahepatic cholestatic patients and extrahepatic cholestatic group when serum alkaline phosphatase measured (P = 0.610). Conclusion: From these findings, it was concluded that the level of direct bilirubin in sera of extrahepatic cholestasis group when compared with intrahepatic cholestasis group is elevated, serum total bilirubin, and alkaline phosphatase levels are good markers in determining the poor prognosis of cholestasis disease. In neonate, the jaundice is common, usually secondary to unconjugated or indirect hyperbilirubinemia, conjugated hyperbilirubinemia ensures proper evaluation as the timing of the invention in some cases directly affects the clinical outcome, bile consists mainly of bile acids, bilirubin, and fats, is formed in the liver, and is secreted into the canaliculus, from the canaliculus, bile flows into biliary ducts from where it is eventually secreted into the intestine after temporary storage within the gallbladder. They are reabsorbed in the gut together with the nutrients and backed to the liver through the portal vein, too much bile acid levels are toxic., Disabling of this process at any level leads to cholestasis, cholestasis is the end effect of obstruction of the normal excretion of bile from the liver, giving rise to the abnormal accumulation of bile salts, bilirubin, and lipids in liver and the blood, the abnormal retention of bilirubin, high serum levels in cholestasis, excretion of bile acids in urine, and wide availability of testing make serum-conjugated bilirubin clinically the more useful marker of cholestasis next to urine test, clinically, the cholestasis in the infant may present as jaundice, pruritus, and fat-soluble vitamin deficiency. In case of jaundice in infants is usually clinically evident when the total serum bilirubin level exceeds 2.5–3.0 mg/dl (42–51 mmol/L) and is seen as scleral icterus or yellowing of the oral mucosa, conjugated hyperbilirubinemia in an infant (direct bilirubin levels >1.0 mg/dl or >17 mmol/L, or >15% of total bilirubin) is never normal and indicates hepatobiliary abnormality, secondary laboratory evaluations after cholestasis is determined may include serum alkaline phosphatase. Biliary atresia shows commonly with cholestasis between 2 and 5 weeks of life, acholic stools may be show and determine biliary obstruction; so as cholestasis and chronic inflammation lead to malabsorption, many infants with biliary atresia showed insufficient weight gain and are characterized as failure to thrive;, early path of disease, infants with biliary atresia usually reveal conjugated hyperbilirubinemia (direct bilirubin 2–7 mg/dl with total bilirubin levels between 5 and 12 mg/dl), with increase in transaminases and gamma-glutamyltransferase. Alkaline phosphatase is glycosylphosphatidylinositol-anchored ecto-phosphomonoesterases with different tissue expressions and multiple isoforms.,, Patients with liver disease only hepatic alkaline phosphatase will be found in their serum, particularly cholestatic patients, mild-to-moderate increasing of the enzyme (two to three times the higher limits of normal) can be seen in all types of liver disorders, significant increasing (more than three times the higher limits of normal) are mainly seen in diseases associated with intra- or extra-hepatic cholestasis, the amount of elevation does not differentiate between intra- and extra-hepatic cholestasis., Proof indicates that serum alkaline phosphatase activity offers helpful data for the long-term prognosis of primary biliary cirrhosis. In liver diseases, the marked increasing of serum alkaline phosphatase activity is an indication of cholestatic conditions; in cholestasis, elevated serum alkaline phosphatase activity is primarily resulted from elevated hepatic synthesis and the following release of liver alkaline phosphatase in the sinusoidal blood flow. The aim of this study was to assess the clinical value of serum total bilirubin, direct bilirubin, and alkaline phosphatase in children with cholestasis. The study was executed during the term from January 2018 to June 2018, this study included 60 patients with diseases and 25 healthy controls and distributed into three groups:First group includes 40 patients with intrahepatic cholestasis diseases, second group includes 20 patients with extrahepatic cholestasis diseases, and third group: represents the apparently healthy control group which comprises of 25 individuals who do not suffer from liver disease or any chronic illness and matched with age and gender to patient groups. All samples were collected from Al-Imameen Al-Kademen Medical City, Digestive Center at Medical City, and Child's Central Teaching Hospital. The exclusion criteria were representing by selected the patients who were do not suffer from dyslipidemia and diabetes mellitus or any other disease that may interfere with the study and patients who were not underwent any type of therapy such as ursodeoxycholic acid and were stopped the treatment 2 weeks before investigations. The preparation of blood samples was done by collected about 5 mL of blood that obtained from veins of patients having cholestasis and healthy controls. Blood samples were left for 20 min at room temperature. After coagulation, sera were separated by centrifugation at 3000 rpm. For 10 min, aspirated and stored at 20 until assayed for total/direct bilirubin and alkaline phosphatase. They were measured using enzyme-linked immunosorbent assay kits. The human total/direct and human alkaline phosphatase kits were obtained from Kono Biotech Company. The median of serum total bilirubin in the control, intra- and extra-hepatic cholestasis groups was (0.54, 5.05, and 15.48) mg/dl, respectively, has a highly significantly elevated in an intra- and extra-hepatic cholestasis groups when compared with control (P < 0.001). This is s a significant difference between groups according to the Mann–Whitney test as shown in [Table 1]. The median of serum direct bilirubin in the control, intra- and extra-hepatic cholestasis groups was (0.05, 3.55, and 10.88) mg/dl respectively, has a highly significantly elevated in an intra- and extrahepatic cholestasis groups when compared with control (P < 0.001). This is a significant difference between groups according to the Mann–Whitney test as shown in [Table 1]. The median of serum alkaline phosphatase in the control, intra- and extra-hepatic cholestasis groups was (88, 559, and 527) U/L respectively, has a highly significantly elevated in an intra- and extra-hepatic cholestasis groups when compared with control (P < 0.001). This is a significant difference between groups according to the Mann–Whitney test as shown in [Table 1]. There was no statistical difference between the intrahepatic cholestatic patients and extrahepatic cholestatic group in terms of age, weight, weight for age, height, stature for age, and serum alkaline phosphatase (P = 0.368, 0.235, 0.059, 0.281, 0.368, and 0.610), respectively, but there was a highly significantly elevated serum total bilirubin and direct bilirubin when compared the extrahepatic cholestatic group with intrahepatic cholestatic group (P = 0.002 and 0.017), respectively, and these are significant differences between intrahepatic cholestasis and extrahepatic cholestasis groups according to the Mann–Whitney test as shown in [Table 2]. 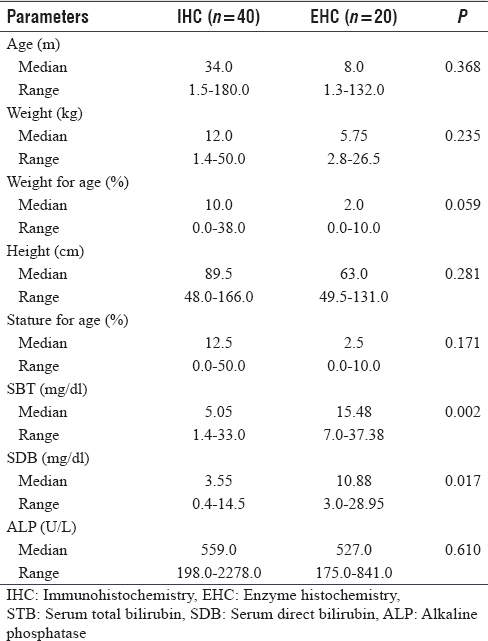 The median of total bilirubin of the present study in sera of intrahepatic cholestasis 5.05 mg/dl with range 1.4–33 mg/dl, extrahepatic cholestasis 15.48 mg/dl with range 7–37.38 mg/dl, and control 0.54 mg/dl with range 0.25–1.1 mg/dl, total bilirubin showed an elevation in patients with intra-and extra-hepatic cholestasis groups when compared with control group. As shown in [Table 1], this study revealed that high levels of total bilirubin was associated with poor prognosis of cholestasis disease, which agree with the finding of the significant association between the high levels of total bilirubin and cholestasis disease may be attributed to impairment one of the pathway of bile secretions from the hepatocytes into the canaliculi or obstruction of bile duct. Alkaline phosphatase is glycosylphosphatidylinositol-anchored ecto-phosphomonoesterases with different tissue expressions and multiple isoforms, alkaline phosphatase is able to hydrolytic transphosphorylase and phosphatase activity on host-derived nucleotides such as ATP, ADP, and uridine diphosphate.,, The median of alkaline phosphatase of the present study in sera of intrahepatic cholestasis 559 U/L with range 198–2278 U/L, extrahepatic cholestasis 527 U/L with range 175–841 U/L, and control 88 U/L with range 39–441 U/L, alkaline phosphatase showed an elevation in patients with intra- and extra-hepatic cholestasis groups when compared with control group [Table 1]. One of the most difficult issues is the number of patients that suffer from cholestasis in Iraq and their knowledge how to get early to specialist centers for diagnosis when they suffer from jaundice in the long term which may be having cholestasis in fact. There was an elevated serum total/direct bilirubin in patients with extrahepatic cholestasis when compared with patients of intrahepatic cholestasis. Lane E, Murray KF. Neonatal cholestasis. Pediatr Clin North Am 2017;64:621-39. Kuipers F, Bloks VW, Groen AK. Beyond intestinal soap – Bile acids in metabolic control. Nat Rev Endocrinol 2014;10:488-98. Matsubara T, Li F, Gonzalez FJ. FXR signaling in the enterohepatic system. Mol Cell Endocrinol 2013;368:17-29. Moyer VA, Ahn C, Sneed S. Accuracy of clinical judgment in neonatal jaundice. Arch Pediatr Adolesc Med 2000;154:391-4. Howard ER. Surgery for biliary atresia. Curr Paediatr 1995;5:28-31. Shneider BL, Brown MB, Haber B, Whitington PF, Schwarz K, Squires R, et al. Amulticenter study of the outcome of biliary atresia in the United States, 1997 to 2000. J Pediatr 2006;148:467-74. Hoylaerts MF, Manes T, Millán JL. Mammalian alkaline phosphatases are allosteric enzymes. J Biol Chem 1997;272:22781-7. Millán JL. Alkaline phosphatases: Structure, substrate specificity and functional relatedness to other members of a large superfamily of enzymes. Purinergic Signal 2006;2:335-41. Zimmermann H, Zebisch M, Sträter N. Cellular function and molecular structure of ecto-nucleotidases. Purinergic Signal 2012;8:437-502. Van Hoof VO, De Broe ME. Interpretation and clinical significance of alkaline phosphatase isoenzyme patterns. Crit Rev Clin Lab Sci 1994;31:197-293. Sotil EU, Jensen DM. Serum enzymes associated with cholestasis. Clin Liver Dis 2004;8:41-54, vi. Poupon R. Liver alkaline phosphatase: A missing link between choleresis and biliary inflammation. Hepatology 2015;61:2080-90. Kaplan MM, Righetti A. Induction of rat liver alkaline phosphatase: The mechanism of the serum elevation in bile duct obstruction. J Clin Invest 1970;49:508-16. Bezerra JA, Balistreri WF. Cholestatic syndromes of infancy and childhood. Semin Gastrointest Dis 2001;12:54-65. Nittono H, Takei H, Unno A, Kimura A, Shimizu T, Kurosawa T, et al. Diagnostic determination system for high-risk screening for inborn errors of bile acid metabolism based on an analysis of urinary bile acids using gas chromatography-mass spectrometry: Results for 10 years in Japan. Pediatr Int 2009;51:535-43. Cuperus FJ, Claudel T, Gautherot J, Halilbasic E, Trauner M. The role of canalicular ABC transporters in cholestasis. Drug Metab Dispos 2014;42:546-60. Srivastava A. Progressive familial intrahepatic cholestasis. J Clin Exp Hepatol 2014;4:25-36. Lu FT, Wu JF, Hsu HY, Ni YH, Chang MH, Chao CI, et al. γ-glutamyl transpeptidase level as a screening marker among diverse etiologies of infantile intrahepatic cholestasis. J Pediatr Gastroenterol Nutr 2014;59:695-701. Fawaz R, Baumann U, Ekong U, Fischler B, Hadzic N, Mack CL, et al. Guideline for the evaluation of cholestatic jaundice in infants: Joint recommendations of the North American Society for Pediatric Gastroenterology, Hepatology, and Nutrition and the European Society for Pediatric Gastroenterology, Hepatology, and Nutrition. J Pediatr Gastroenterol Nutr 2017;64:154-68. Bellomo-Brandao MA, Arnaut LT, Tommaso AM, Hessel G. Differential diagnosis of neonatal cholestasis: Clinical and laboratory parameters. J Pediatr (Rio J) 2010;86:40-4. Chen ST, Su YN, Ni YH, Hwu WL, Lee NC, Chien YH, et al. Diagnosis of neonatal intrahepatic cholestasis caused by citrin deficiency using high-resolution melting analysis and a clinical scoring system. J Pediatr 2012;161:626-31.e2. Bastos MD, da Silveira TR. Blood levels of Vitamin D in children and adolescents with chronic cholestasis. J Pediatr (Rio J) 2003;79:245-52. Wang JS, Tan N, Dhawan A. Significance of low or normal serum gamma glutamyl transferase level in infants with idiopathic neonatal hepatitis. Eur J Pediatr 2006;165:795-801.